St Austell Brewery has agreed to a major deal with Healey’s Cornish Cyder Farm to continue selling the popular Cornish Rattler Cyder in its pubs for the next five years. An advocator of local sourcing, St Austell Brewery gave Cornish Rattler its first break in 2004 when they agreed to stock the cyder in many of its 168 pubs. The five year deal with Cornish Rattler is a strong commitment towards long term local sourcing and a positive step in driving forward the local economy by working with and supporting local businesses. 12 months since then, Cornish Rattler sales have doubled and across the region the cyder has sold more than one million pints, stimulating a significant growth in production at the Cyder Farm in Penhallow near Truro to keep up with demand. 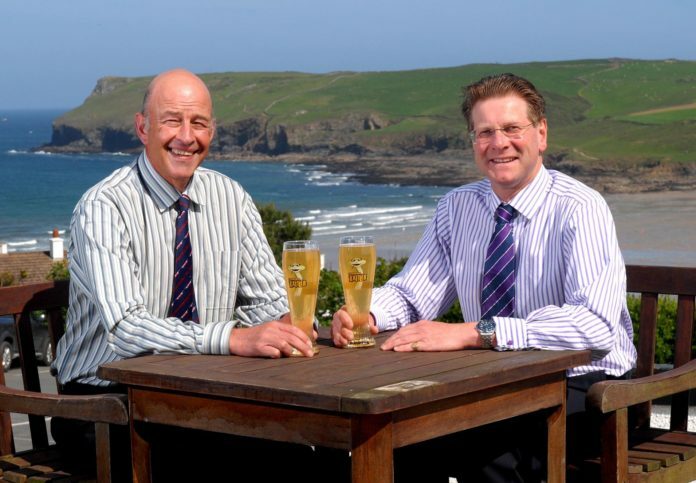 James Staughton, Managing Director of St Austell Brewery, and Healey’s Cornish Cyder Farm owner David Healey raised a glass to the new deal which formalises the close working relationship between their businesses. James Staughton said: “It’s great for two Cornish businesses to be working together on what is a fantastic local success story. We’re delighted with the role St Austell Brewery plays in helping Cornish Rattler on its road to success from putting the draught cider into kegs through to distributing Rattler to our own pubs and to free trade customers. We are proud to be continuing our support for it. David Healey said: “The association with St Austell Brewery has enabled us to grow our business substantially over the past four years by reaching the many hundreds of pubs St Austell Brewery supplies in the South West. Cornish Rattler is proving to be a very popular drink and we are delighted to see it on the bar in pubs across the region. Cornish Rattler gets its name from an old fashioned variety of Cornish apples which were grown in the Truro area. At 6% ABV Cornish Rattler has quite a bite; the cloudy, sparkling cyder has a clean and fruity taste that provides a refreshing apple burst.